For the past month or so, we have been enjoying the company of a couple of traveling companions. They don't take up much room in the car, don't need a ticket when we travel by train or air, and rarely need their laundry done. They are a little picky in their eating habits, preferring flounder, pancakes, thin-crust pizza, flat bread, and cookies. They will eat fruit and veggies but like them thinly sliced. Their names are Flat Alex and Flat Stanley. 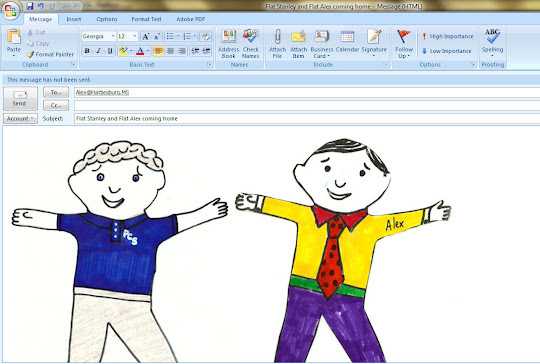 Flat Stanley is the one in the yellow shirt, and Flat Alex is wearing his blue school shirt. Our 7-year-old great nephew Alex, who lives in Hattiesburg, Mississippi, was nice enough to send these guys to travel with us for a while. Since we were moving around and didn't have a mailing address, Alex and his mom figured out a way to send the two boys through cyberspace by letting them grab on to an email message. Flat Alex and Flat Stanley hung on tight and climbed out of our computer one day when we were in Italy. After that they went everywhere with us and made our trip much more exciting. 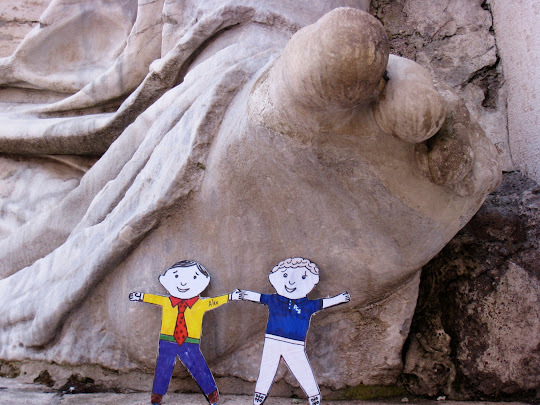 Flat Stanley and Flat Alex always have their own ideas of fun things to do. 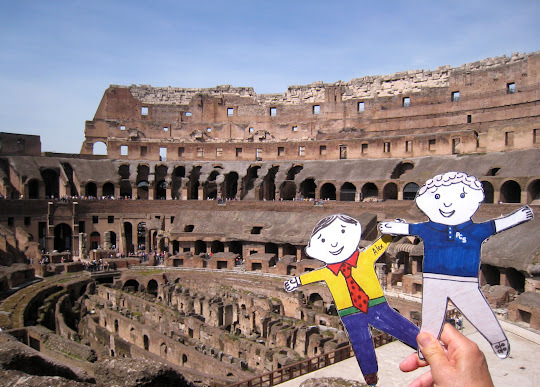 When we visited the Roman Colosseum in Rome they decided to perform like rock stars. They tried to sing a Carrie Underwood song, "Flat on the Floor," but their voices were a little... well, flat. Then they started laughing, and we were laughing, and pretty soon, all the other visitors were cheering and laughing, too. Everyone has more fun with these guys around. Later at Rome’s Trevi Fountain, Flat Stanley and Flat Alex wanted to go for a swim. We had to gently explain to them that water can be very dangerous for flat guys like them. Fortunately they learned about the tradition of throwing coins in the fountain to ensure you'll return to Rome and, six coins later, they had forgotten about swimming. 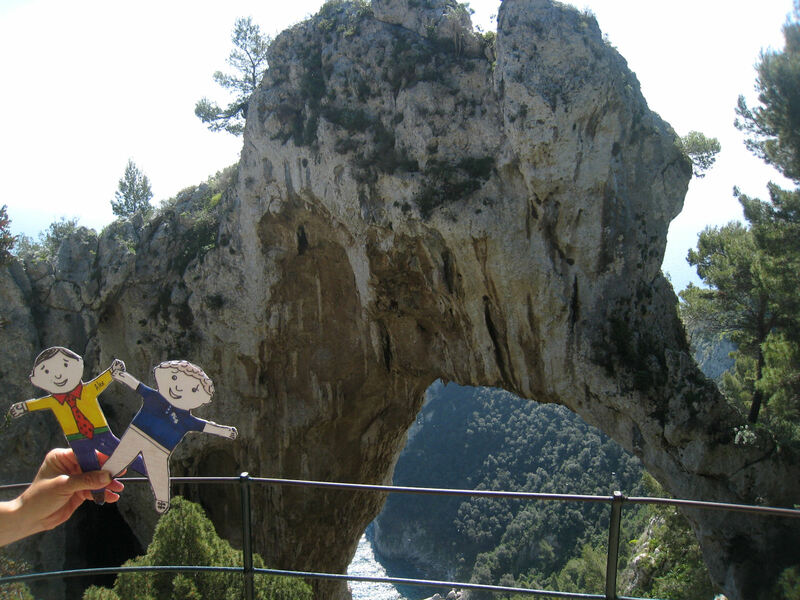 On the isle of Capri, off the Italy coast, we visited Arco Naturale, a natural limestone arch on the island. We didn't notice until Flat Alex pointed it out that the arch looked like an elephant. Flat Alex said he always watches out for elephants because he once got a very close look at the bottom of an elephant’s foot. You can guess the rest of that story. Even though they prefer paintings, both guys enjoyed looking at statues also. They chose this one in Rome as their favorite. When we asked why they liked this particular one so much, they just giggled. Finally they admitted it was because it had flat feet. Yes, they can be silly sometimes. And nothing sends them into fits of laughter more than when one of them has… uh, flatulence. Flat Alex and Flat Stanley would rather be traveling in the flatlands, but they did enjoy the mountains around Moustiers Sainte-Marie in France. They were fascinated by the legend of the star, a four-foot metal ornament which was hung between two cliffs hundreds of years ago. Their favorite thing about the star was not its gold color, however, but its two-dimensionality. Can you see the star in the photo with the boys? 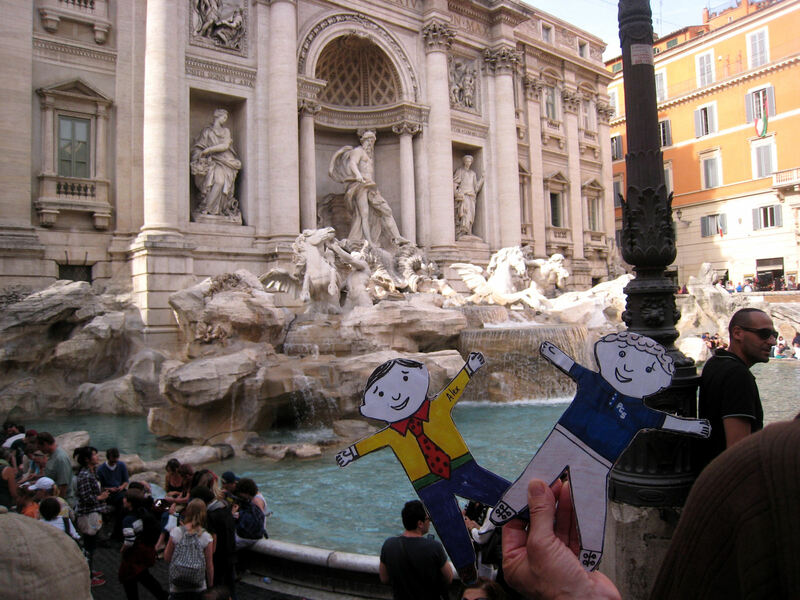 It is just above Flat Stanley's left wrist, and the sun is shining on it. 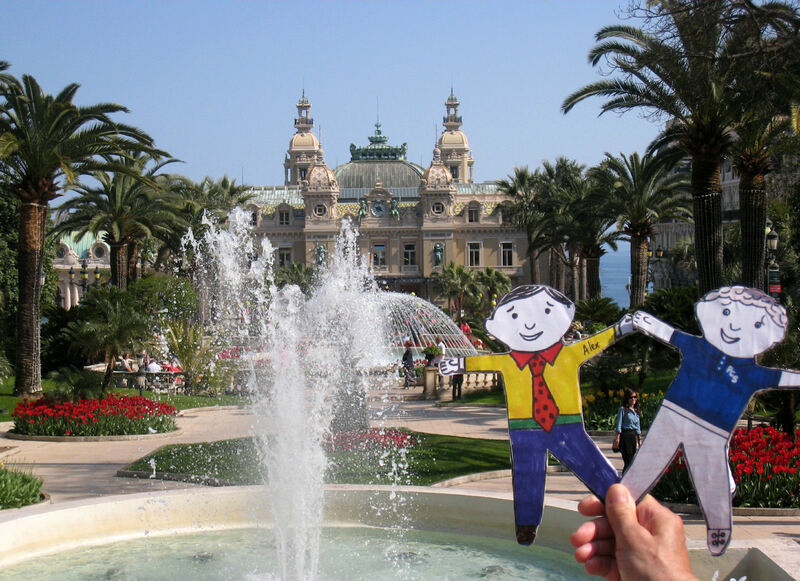 In Monaco, Flat Stanley and Flat Alex wanted to play some games at the famous Monte Carlo Casino. Of course, that wasn’t in the cards. Not only were they too young to get into the casino, they were both flat broke anyway. 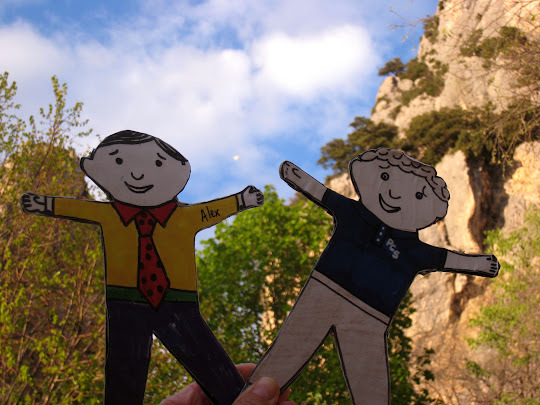 Unfortunately, Flat Stanley and Flat Alex had to go back home to Alex today. So they climbed back into our computer and away they zipped back to Mississippi. Too bad. They really wanted to go with us to the UK next month when they heard we might be staying in a flat. We were very flattered that they decided to travel with us for a while. To learn more about their trip, you can check out the book they wrote about their European vacation here. If you're not familiar with Flat Stanley, a character from a 1964 children's book by Jeff Brown, he has his own Wikipedia article.